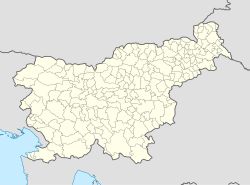 Podnanos (pronounced [pɔˈdnaːnɔs]; formerly Šent Vid or Šentvid (nad Vipavo), Italian: San Vito di Vipacco) is a village in the upper Vipava Valley in the Municipality of Vipava in the Littoral region of Slovenia. It lies below Mount Nanos, from which it gets its current name. The name of the settlement was changed from Šent Vid (literally, 'Saint Vitus') to Podnanos (literally, 'below Mount Nanos') in 1952. The name was changed on the basis of the 1948 Law on Names of Settlements and Designations of Squares, Streets, and Buildings as part of efforts by Slovenia's postwar communist government to remove religious elements from toponyms. The local name of the settlement, Šembid, is derived from Šent Vid. The parish church in the settlement is dedicated to Saint Vitus and belongs to the Koper Diocese. ^ Premrl, Radoslava. 1992. Moj brat Janko - Vojko. Ljubljana: Slovenska matica, p. 5. Wikimedia Commons has media related to Podnanos. This article about the Municipality of Vipava in Slovenia is a stub. You can help Wikipedia by expanding it. This page was last edited on 25 October 2018, at 16:15 (UTC).